Means of transport is one of the topics you cannot avoid. Nowadays people travel a lot and they often have to do it on daily basis. And thus it is one of the most natural topics for a conversation in a class. 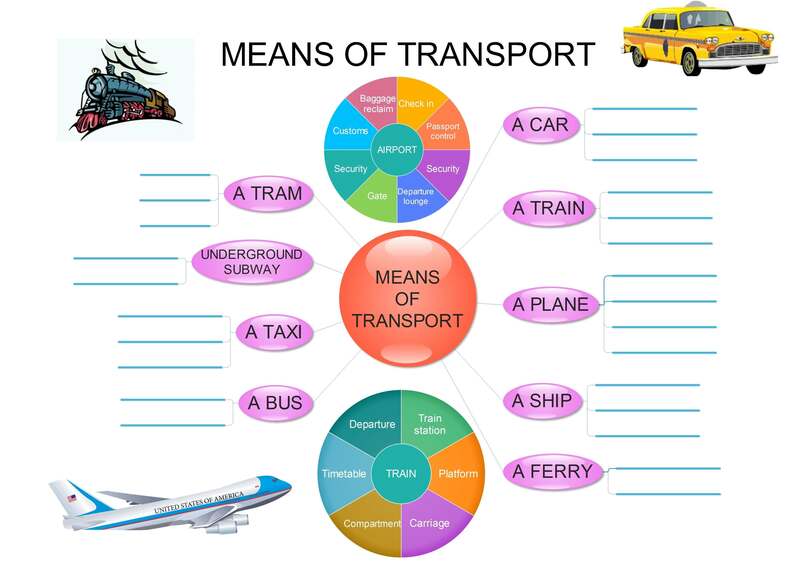 Here you can learn the names of several means of transport and you can learn to speak about them fluently. To help you achieve this there is a mind map, a video, several worksheets and two games. In the following exercise, you can try listening again and tick all the means of transport you hear. After introducing the vocabulary, it is time to learn it. The following worksheet contains three activities for you. There is a crossword, a spiral crossword and a set of jumbled words. Print the worksheet out and try to complete the activities. If you are a teacher, it might be a good idea to include the BINGO game in your lesson. There are 18 different BINGO cards for you to print out. You can either call out the words yourself or you can ask your students to write 3 sentences which contain one or two of their words. Then each student reads one of their sentences and the others cross out the words they hear. Do not forget to set the winning combination before you start the game. This part is the most difficult one. While the previous activities were for elementary students of English, this one is more suitable for pre-intermediate and intermediate learners. Print out the following mind map and then watch the video and complete it. At the end of the video there is a task to speak about the given topics for the set times. You can, or better you should, use your mind map with your notes. If you can speak about the means of transport, the following games will be a piece of cake for you. The first game is quite easy. Complete the quiz and if you pass you can play the game called Tower defence. The game and the quiz are in HTML 5 so they will play on your mobile device. The second game is slightly more difficult. Your task is to complete the sentences from the video, so if you are not sure what there was, play the video on means of transport again. If you pass the test you can play the Indiara game. Good luck. It is amazing free lectures.It is plus to the deadly needed people. Congrats ! Great materials !!! Interesting.. It is helpful for foreign students. Thank you a lot. Any way to view the videos other than on youtube? I teach in China and cannot access youtube. Can you watch Vimeo? Or is there a Chinese Youtube?